I am definitely one of those people, who loves to eat as much as I love to cook and I am always cooking up a storm, it help relaxes me and excites me all at the same time. 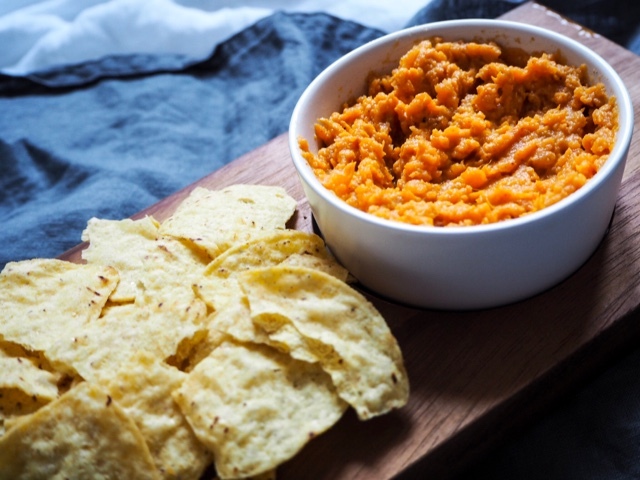 It came as no surprise how excited I was when I combined my two favourite ingredients together and made the perfect blend of roasted sweet potato & tahini dip. This little colourful snack is jam packed with flavour thanks to the sweet potatoes being roasted and is rounded off nicely with a helping hand of tahini, it is a satisfying side dish to enjoy all whilst on the sofa, snuggled up Hygee style with candles burning and your favourite programme on, or being it Spring, a perfect picnic treat. 1. Preheat the oven to 180C / Gas Mark 4 and pop your sweet potato on a baking tray lined with parchment paper and pop in the oven for a good hour! You want your the flesh of the potato to be super soft, plus the longer they are in for the more robust they will taste. 2. Once the sweet potato are done and cooled, scoop out all the flesh and add to a bowl add your tahini, salt and paprika and mash together with the back of a fork. How easy is that! A great side dish which can be enjoyed with a variety of other cut vegetables or even popped into a pitta sandwich. I certainly doubt it, but if you have any leftover, store in an airtight pot in the fridge and enjoy within 3 days. 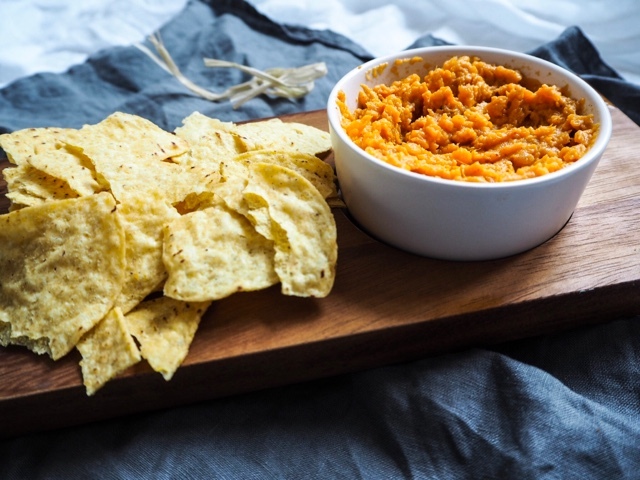 Are you a chip and dip kinda person, what is your favourite combo? Looking for another great recipe this Spring, then I would certainly recommend another super quick recipe my chilli prawns with courgette spaghetti.